Living a life of gratitude doesn’t mean I know how to respond to praise and criticism correctly. I don’t respond well to either of them but I never asked myself why. I have come to realize the answer to this never asked question is poor self-image. As a preteen to early teen age years, I would say appearance wise I was ugly. Do not judge me in saying that. This came from the mind of a child, wanting to fir in, wanting to be popular not realizing the beauty inside. As time went by I traded the glasses for contacts and the braces were gone. Self image was boosted. Then I went through a long period of emotional abuse. The self-image was almost crushed. Then God began to show me, Who I was!!! It wasn’t until I saw myself through His eyes that the healing was able to begin. What I was able to see through Him is that I am His beautiful, strong and loving child. When you have been emotionally abused, every criticism cuts through you to the bone and very little to no praise is ever offered. Over time your self-image can be completely lost by believing and accepting those lies as truths. The abuse starts out gradual and out of the blue. The lie is always with a demand for change on your part and consequences for not making that change. It then escalates into all out criticism, no matter what you do or say it is never right or enough. Breaking free from this kind of abuse was through God for me. God taught me how to respond and how to rebuild myself image through Him. Even now I am still learning who I am in Him and to Him. I have also learned that not all criticism is bad and that I need to view criticism in another way. To accept valid criticism is like a beautiful accessory to be worn. It is helpful, not hurtful. Complements and praise should be easy to accept and receive. It was not until recently that I discovered why I was always uncomfortable with receiving it. It has always been difficult. Whenever it was offered to me I usually had one of two ways of receiving it. Walk away and say nothing or hang my head down and utter thank you sometimes with an explanation and sometimes with just the thank you. It wasn’t until I asked myself why I could not accept praise that the answer came. It was shame of not feeling worthy of praise or complements.This has been an effect of poor self-image. A tool satan uses to lower me because I would not allow myself to be emotional abused any more. He had to find another way to destroy me, my character. The responses to praise or complements come off as prideful and selfish. This is not what God wants for my life or yours. Life is about relationships and a relationship with Him. He doesn’t want us to be hindered from enjoying our life through Christ. In order to have enjoyment, we also have to be able to accept and receive praise. We also have to remember not to seek praise for something we do. God know what is in our heart when we do something. We just need to do what God wants us to do. May prayer is that God would help those (myself included) who need healing to be able to receive praise and complements for what they are. A genuine love from others. 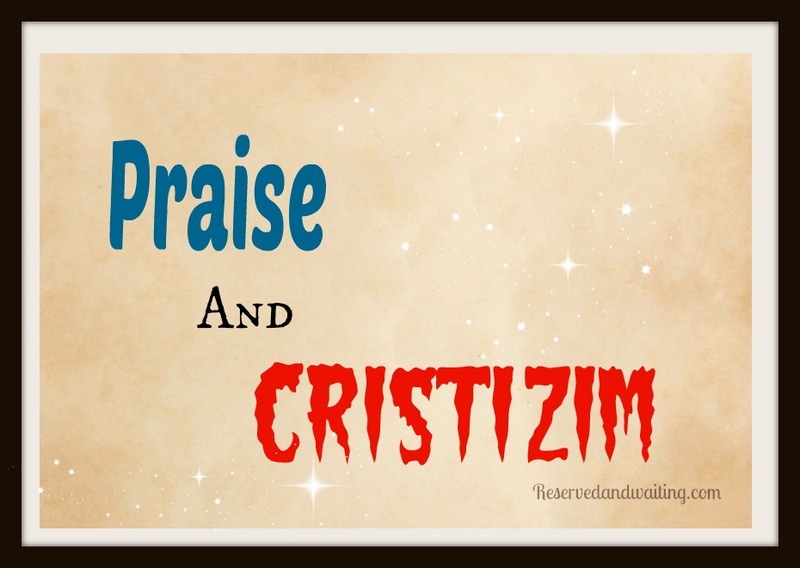 How we receive praise and criticism reflects on our witness for Christ. Both are elements in our spiritual growth.